The phenomenal scuba diving locations off the shores of the Yucatan Peninsula draw scores of scuba diving enthusiasts from throughout the world. What makes diving in the western Caribbean off the Yucatan so attractive to scuba diving aficionados? The Great Meso-America Reef system stretches more than six hundred miles. It is the second largest barrier reef on the planet. The best locations are within range of any of the resort locations in the region, including Riviera Maya, Cozumel, Isla Mujeres, Playa del Carmen, and Cancun. The vibrant reefs of this region offer divers a wide variety of aquatic creatures, as well as colorful corals and sponges. What really sets the waters of this area apart from other tropical scuba diving locales are the astounding sights you will view through the crystalline waters. Islands like Cozumel and Isla Mujeres are located next to some of the most incredible coral reefs on the planet. The amazing coral reefs of this area are home to an array off coral formations, colorful sponges, marine turtles, mantas, morays, octopuses, mollusks, crustaceans, and an unimaginable collection of tropical fish. The Yucatan Jungle also offers scuba divers a truly unique scuba diving experience. Divers can explore the mysterious flooded caverns called cenotes on the mainland. We supply our clients with the most high-tech scuba diving gear to utilize on our diving excursions. All of our equipment is scrupulously inspected by our professional staff. Our specially-customized diving crafts are fully outfitted with every amenity in order to ensure that our clients enjoy the best diving expedition. See the amazing diversity of aquatic species off Playa Del Carmen on our two-tank scuba diving adventure. The regional waters are world-famous for its clear waters and thriving reef habitats. 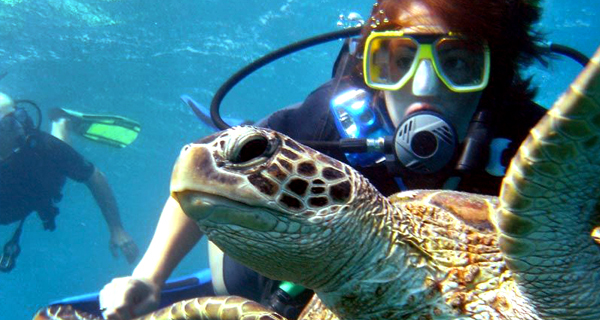 Enjoy a phenomenal guided one-tank scuba diving excursion from Playa Del Carmen. This region is home to some amazing reef diving sites for you to explore under the supervision of our professional dive masters. Wade into the crystal clear waters from Playa Uvas for an incredible underwater two tank dive tour of Chankanaab Reef where you will discover a wondrous aquatic habitat full of fascinating creatures and brightly-hued tropical fish. The teeming coral habitats off the coast of Cozumel have attracted droves of scuba divers from all over the planet. Join our professional dive-masters for a one-tank maritime excursion to see the wondrous amounts of marine life in the calm transparent waters off the leeward shore of Cozumel. Only a short ferry ride from Cancun lies the beautiful island of Cozumel with its equally beautiful diving sites. Shallow underwater reefs and incomparable visibility have made Cozumel a popular destination for beginner and expert divers alike and we invite certified divers to experience the reason for themselves! 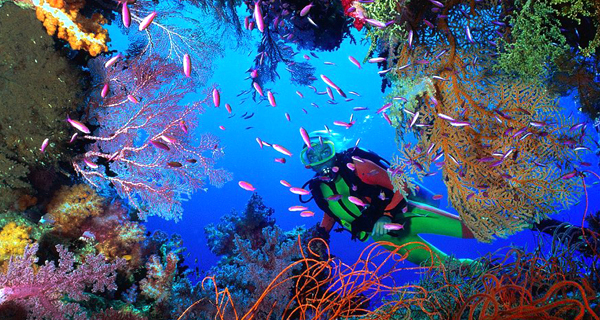 The thriving coral gardens off the shores of Cozumel have drawn countless scuba divers from across the globe. Join our expert dive guides for a two-tank underwater adventure to witness a vast array of aquatic species in the placid clear waters off the leeward coast of Cozumel. Night diving allows scuba divers to see a whole different underwater environment as nocturnal species that are hidden from view during daylight hours emerge to swarm the fantastic reef off the shores of Cozumel. Join our dive guides for a phenomenal night-time maritime excursion.